Toxic chemical and radioactive incidents represent the major causes of chemical and radioactive contamination of the environment, which threatens people’s lives and property, and social security, order and safety. Given its assigned functions and missions, the Chemical Corps has been employing many fundamental measures to improve its response to toxic chemical and radioactive incidents and preserve the environment. 1. To promote propaganda and education aimed at raising officers and soldiers’ awareness and responsibilities for the task of preventing and coping with toxic chemical and radioactive incidents and environmental catastrophes. The Chemical Corps directs offices and units to continue to profoundly grasp the Party, Central Military Commission and Ministry of National Defence’s resolutions and directives on environmental protection, particularly Resolution No. 41-NQ/TW dated April 14th, 2004 of the Political Bureau (9th Tenure) on “environmental protection in the process of industrialization and modernization”; Regulations on dealing with toxic chemical incidents promulgated with Resolution No. 26/2016/QĐ-TTg dated July 1st, 2016 of the Prime Minister; Resolution No. 689-NQ/QUTW dated October 10th, 2014 of the Central Military Commission on “preventing and coping with consequences of natural disasters, catastrophes and search and rescue by 2020 and beyond”; the Ministry of National Defence’s environmental protection strategy by 2020 and a vision to 2030, and Regulations on environmental protection in Vietnam People’s Army (VPA). At the same time, it is necessary to increase the awareness of officers and soldiers, first and foremost of party executive committees and commanders at all levels, of the potential risks and ill effects of toxic chemical and radioactive incidents, and their role and responsibilities. In terms of perception, Chemical Soldiers at all levels have to determine clearly that response to toxic chemical and radioactive incidents and environmental protection constitutes one of their key political tasks – “combat mission in peacetime” so as to give prominence to responsibility for leadership, direction and execution. To achieve high performance, offices and units, during their education processes, need to combine propaganda and education on environment, situation and the risk of environmental pollution with tradition education and transmission of experience and skills in search and rescue, and so on. On such a basis, it is important to equip officers and solders with firm political stance, bravery and willingness to assume and fulfill every assigned tasks; and strongly oppose subjectivism, demonstration of decline in fighting spirit, and fearfulness of difficulty and hardship. 2. To actively advise and recommend measures to successfully implement the environmental protection strategy in the VPA to the Central Military Commission and Ministry of National Defence. Active prevention and effective response to toxic chemical and radioactive incidents represent vital content of the environmental protection strategy. Given its assigned missions, the Chemical Corps continues to perceive and concretize the Ministry of National Defence’s environmental protection strategy by 2020 with a vision to 2030 in an appropriate manner. Accordingly, the Corps instructs its organizations and units to coordinate with relevant offices of the Ministry of National Defence, levels, industries, forces and localities to have a thorough grasp of the situation, survey and assess the risk of accidents at key chemical and radiation facilities; give advice and make recommendations on measures to manage, prevent and deal with incidents, especially in areas of high risk. The Chemical Corps will take the lead in developing and perfecting software for the safe management of chemicals and radioactivity nationwide in the immediate term so as to control chemical and radioactive sources. At the same time, it will take part in drafting and submitting legal normative acts that identify clearly responsibility of levels and industries for preventing and coping with incidents; advise and recommend the organization and building of specialized chemical forces and on-the-spot chemical forces; and conduct training and disseminate knowledge of denying, preventing, and responding to the use of WMDs and protecting against and responding to toxic chemical and radioactive incidents for localities and enterprises. Today, there remains an enormous amount of toxic legacy of the war in our country. This is a dangerous source of toxic chemical pollution. As the leading force in this sphere, on the one hand the Corps continues to coordinate with relevant ministries, industries and localities to survey, investigate and appraise the levels of toxic pollution; map, localize and warn against contaminated sites. On such basis, it will advise and recommend solutions to strictly deal with the Agent Orange/dioxin. On the other hand, the Chemical Corps continues to advise and guide the implementation of Directive No. 05/CT-BQP dated February 03rd, 2017 of the Ministry of National Defence on executing projects and programmes on responding to and dispose of the Agent Orange/dioxin in the VPA; and the programme: “Nuclear technology and safety to ensure the VPA’s combat readiness in the 2016-2020 period with a vision to 2030.” In order to protect against toxic chemical and radioactive incidents, the Corps pays special attention to the uplift of capacity and quality of appraising and evaluating the influence of infrastructure projects, industrial parks, and socio-economic development projects on environment, defence and security as provided in law. In addition, the Chemical Corps seeks to improve execution of the project: “Establishing and perfecting radioactive observation and warning system in the VPA,” which focuses on modernizing environmental monitoring devices and stations in all of 3 regions, especially in Northern region. 3. The Chemical Corps takes the initiative in devising and perfecting plans to cope with incidents in a realistic manner; enhancing training and exercises to improve the capacity of chemical forces at all levels to deal with chemical, biological and radioactive incidents and environmental catastrophes. Toxic chemical and radioactive incidents that once happened would spread rapidly. If they were not timely coped with, they would have serious consequences. Therefore, to strengthen its response, the Corps has to instruct its agencies and units to closely coordinate with localities and chemical facilities to survey and keep track of the situations, and predict potential scenarios. On such that basis, it will invent plans and deploy forces and equipment in an appropriate manner in the direction of “four on-the-spots” and the guiding principle of “proactively protecting against and timely and effectively responding to” incidents, in which priorities are given to the rescue of victims, prevention of toxic leaks, protection of key areas, and good coordination between various forces, as well as mobilization of equipment. Besides, the Chemical Corps requests units to strengthen training and exercises according to scenarios and situations to improve their capacity for organizing, controlling, managing, and dealing with incidents, particularly that of chemical detachments. It regards this as a solution of significant importance to effectively respond to incidents. To produce intended results, it is important for organizations and units to devote further efforts to research and renovate training content and programmes to ensure their conformity with current organization, structure and equipment while making our soldiers highly disciplined, highly mobile, agility, and capable of exploiting effectively available devices, especially the modern ones. 4. To speed up scientific research and international cooperation on responding to toxic chemical and radioactive incidents. Apart from actively consolidating forces, modernizing equipment, and improving the competence of chemical forces at all levels, the Chemical Corps pays attention to scientific research within its specific sphere. The Corps concentrates on scrutinizing and perfecting command and control system, rescue methods and response to incidents; treatment of environmental pollution caused by expired chemical agents that can be used militarily; measures to handle environmental pollution caused by fire and explosion associated with hazardous chemicals; and logistic and technical support procedures. 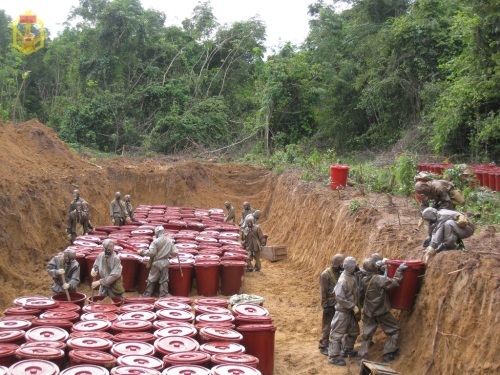 In order to promote the quality of scientific study, the Chemical Corps continues to make investment in the Centre for Environmental Technology while upgrading laboratories, observation stations and experimental factories, particularly those for military chemical analysis, and treatment and disposal technologies for the Agent Orange/dioxin. In today’s integration trends, the Chemical Corps seeks to boost international cooperation in responding to toxic chemical and radioactive incidents aimed at taking advantage of support and assistance of the International Atomic Energy Agency (IAEA) and other international organizations in both material and equipment terms and experience in force buildup, command, training, and exercise. Of particular importance is incident prediction and warning, and use of search and rescue equipment; mechanisms for coordinating efforts; intensification of capabilities to ensure national radioactive security and safety; active participation in bilateral and multilateral search and rescue exercises and training in the region in order to promote exchange, experience sharing, command and control, and capacity for responding to and dealing with unexpected situations, making contributions to enhancing the effectiveness of handling toxic chemical and radioactive incidents and environmental protection, and successfully fulfilling the two strategic tasks of national building and defence.